In Star Parties and Open Days at the Bruce Observatory, some of the things we look at most often are Messier Objects, recognised by the letter "M" followed by a number. Charles Messier was an 18th century French astronomer, who shared with many of his contemporaries a fascination with comets. He developed his "Messier Catalogue" of other, more permanent, fuzzy blobs in the night sky to avoid their confusion with his main target. 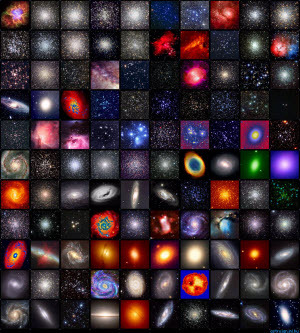 In fact, the fuzzy blobs (nebulae) Messier catalogued covered other galaxies, star clusters within our own galaxy, super-nova remnants, star forming regions, double stars and partial constellations (asterisms). Messier's final list contains 103 objects, although since then it has been supplemented by other astronomers. This section of the web site covers some of the objects you'll see through the Society's telescopes, with short explanations, pictures of the objects as you'd see them through large or space-based telescopes, and YouTube videos about the objects, which we think you'll find interesting.